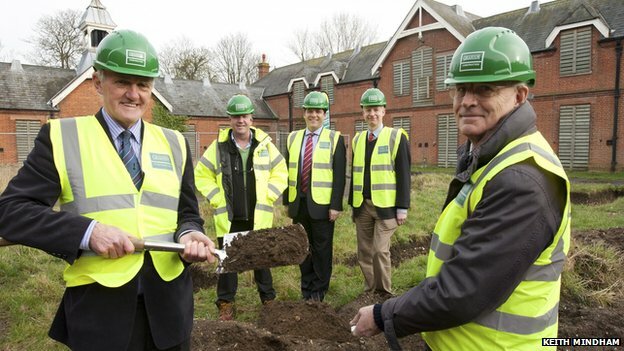 Construction began today on our new National Heritage Centre for Horseracing and Sporting Art. The scheme will see the National Horseracing Museum (NHRM) move from its current location on Newmarket High Street, to the historic Palace House site where it will be joined by a new gallery for the British Sporting Art Trust and a centre for the Retraining of Racehorses charity. Graham Construction have been appointed to construct the project which is estimated to attract approximately 50,000 visitors a year. It is expected to be completed by the end of 2015; opening to the public in spring 2016. The Museum will be owned by Forest Heath District Council and run by the National Horse Racing Museum. Further information can be found on our project page.